Invacare offers a complete line of slings to meet the dynamic needs in both the long-term care and homecare settings. Reliant™ Series Slings are an industry standard, and deliver the ease of use, comfort and security that is standard in all Invacare Products. 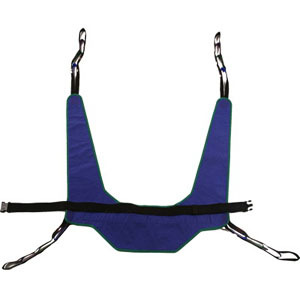 Sling allows superb access for hygiene and clothing removal. It features a fully padded fabric that forms a soft yet supportive surface and soft-brushed lining helps prevent sliding for ultimate comfort and skin protection. The stretch-resistant fabric adds durability and superior support to the user. Invacare Toileting Sling is designed with comfort and safety in mind. Excellent for toileting and bed to chair transfers. 2 support straps on each side for safety. Patient must have full head and neck control for proper use of this sling. Easily removable firm back and contoured headrest.